Most of the larger rivers arise in glaciers. Their flow volume is much greater in summer than in winter. The water in these rivers is usually a milky grey or brown colour depending on the nature of the silt they carry. The rivers erode the bedrock. River courses, gullies and canyons lend strong character to the landscape. Alluvial material from the rivers is deposited on the lowland, as can be seen in the extensive sands in the country’s southeastern coastal regions. Most rivers, except the glacial rivers, are well stocked with brown trout, arctic char and salmon. The country’s deepest lake is 217 metres deep. It was formed by subsidence. Mývatn, in the north of the country, is a remarkable area of contrasts: bubbling hot springs, volcanic craters in a lunar landscape, new lava and flocks of ducks and waders. Throughout Iceland the water is particularly clean. One can safely drink from almost any lake or river, although glacial water is not particularly tasty. Because of the heavy rainfall, Icelandic has plenty of rivers and they are relatively large. Þjórsá, the longest, has a length of 237 km and an average discharge of 380 m³/s, while Ölfusáá has the greatest flow rate at 440 m³/s. 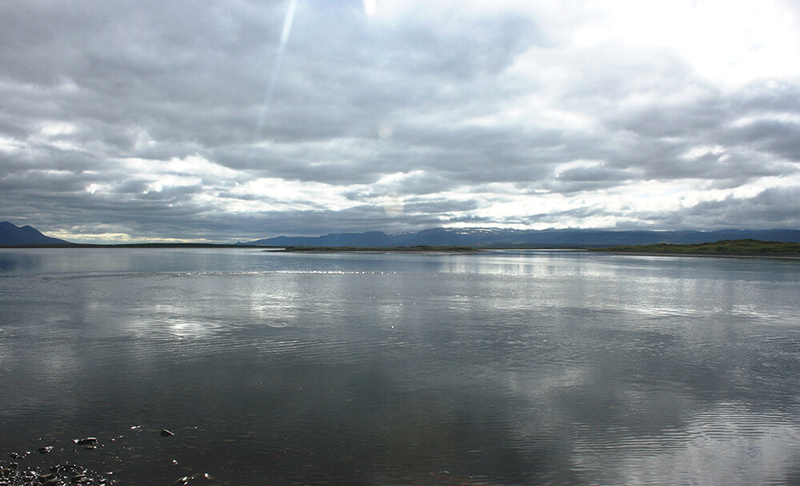 The second-longest river, Jökulsá á Fjöllum, is 206 km in length. Other big rivers include Skjálfandafljót, Jökulsá á Brú, Lagarfljót, Skeiðará and Kuðafljót. The rivers consist mainly of three types. The debris-laden glacial rivers (jökulár) usually divide into a great number of interlinked tributaries that constantly change course and pendulate over the outwash plains (sandur) which lie in front of the glaciers. Skeiðará is a typical example. The maximum discharge in the glacial rivers usually occurs in July or early August. Direct run-off rivers (dragár) drain the old basalt areas and have their maximum discharge in summer and autumn, while spring-fed rivers (lindár), which drain the regions covered by Postglacial lava fields and young Pleistocene rocks, normally have a very constant discharge and temperature. The swift current of the rivers and their tendency to spread out over the lowlands make Icelandic rivers for the most part unnavigable. A wealth of waterfalls is typical of the young landscape: the largest in terms of volume, Dettifoss (44 m), is in Jökulsá á Fjöllum. Other well-known waterfalls are Gullfoss (32 m) in Hvítá, Goðafoss in Skjálfandafljót, and Skógafoss (60 m). Iceland possesses numerous lakes. Some of them are chiefly of tectonic origin, e.g. the two biggest, Þingvallavatn (84 km², 114 m deep) and Þórisvatn (70 km² when not dammed). Others have resulted from the deepening of valleys by glacial erosion (Lögurinn, Skorradalsvatn) or damming by lava flows (Mývatn), glacial deposits and rockslides. Small crater lakes are common in explosion craters, especially in the Landmannalaugar-Veiðivötn area. The Lake Öskjuvatn caldera is the deepest in Iceland (217 m deep, 11 km²). Lakes dammed by ice constitute a special category (Grænalón in Skeiðarárjökull). These lakes are occasionally emptied beneath the damming ice and cause jökulhlaups. On the sandy shores lagoon lakes prove common, the biggest being Hóp (30 km²). Rainfall in Iceland is nearly 2,000 millimetres per annum on average (2 metres). Much of this water is kept in lakes or glaciers. Some of it filters down through the earth to become ground water and some flows directly to the sea. There are many clear rivers in Iceland, mostly with their sources in springs. They are usually found in areas where the lava is young. There are also rivers that channel rainwater directly to the sea. They are found in areas where the bedrock is old and impermeable.